Product #45870 | SKU S-77GRNFLD | 0.0 (no ratings yet) Thanks for your rating! 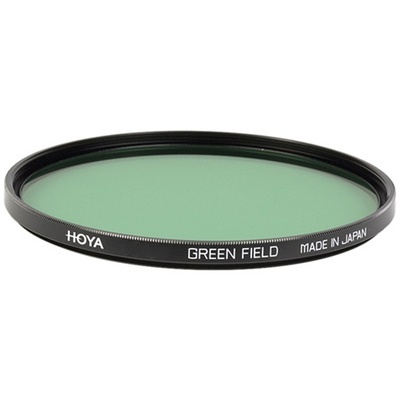 This 77 mm Green Enhancer (Green Field) Filter from Hoya is designed to enhance colours in the green spectrum without changing or having negative effects on other colours. Combining the Green Enhancer with a circular polariser or a UV filter will also increase the saturation of the colour and the sharpness of an image, such as foliage in a landscape shot. The glass filter has a filter factor of 2.5, so you should increase your exposure by 1 and 1/3 of a stop to compensate. Transmission of light passes easier through the filter, because of a single type of coating, which has been placed on both sides of the glass; reducing reflections off the surface of the filter. The ring is made of aluminium adding strength and protection to the lens while it is screwed on. Box Dimensions (LxWxH) 4.4 x 3.6 x 0.5"